The wedding vows I didn't know to make. Six years ago this December, I stood in a wood-paneled courtroom and awkwardly exchanged wedding rings with my boyfriend. I was wearing a brown dress, the only dress that fit over my 8-month pregnant belly, and he was wearing a casual button-down shirt. We recited the lines we were told to say — for better or worse, in sickness and in health... yada yada yada. And that was about it. Married. To be honest, the marriage vows were a means to an end, the end being a marriage certificate and then a new family of three with one cozy last name. 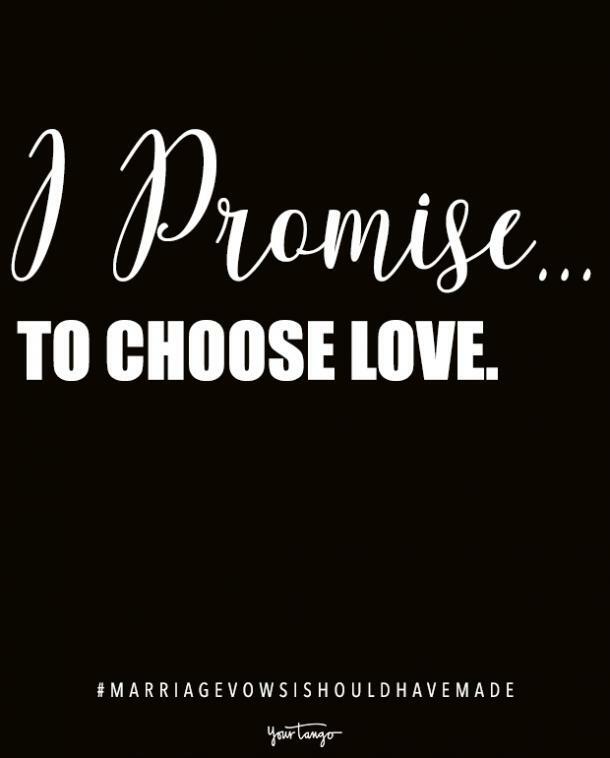 I assumed that our promises were understood without some grand public declaration (and by public, I mean four family members and a small-town mayor): We would do what it takes to make our relationship work, come hell or high water. Turns out, hell came knocking pretty quickly. Our holy matrimony was challenged with worse times, poorer times, and serious sickness. Through it all, we saw the gritty inner workings of not only marriage but of love. We learned more about ourselves and our partnership than we ever expected. I guess that makes sense, right? Maybe the only way to really understand marriage is to go through one. But then how can we make promises about something we haven't experienced? Knowing what I know now, marriage vows are important. They remind us to keep holding on or they raise red flags to aspects of a relationship that need some attention. But marriage vows tend to be lofty, idealistic promises dripping in romance or generic, one-size-fits-all covenants that leave no room for nuance or reality. They often don't reflect the real promises needed in a healthy partnership, which are different for each couple. 1. 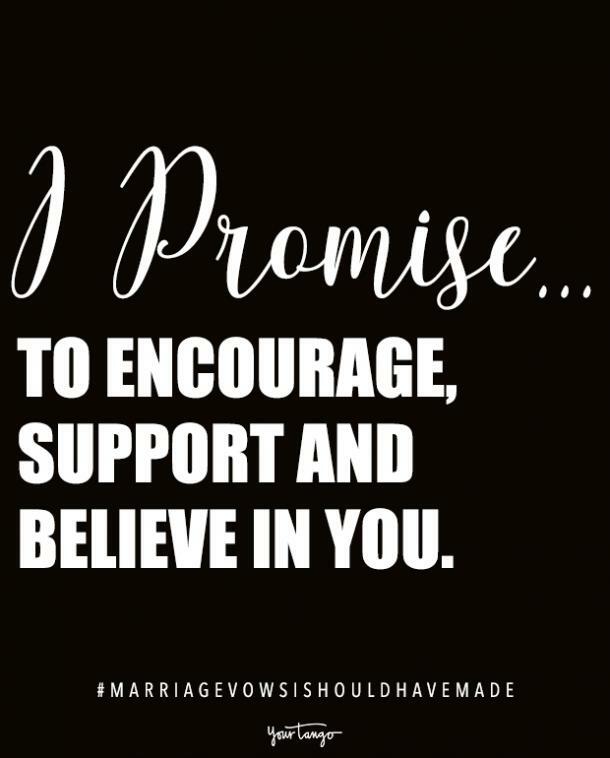 I promise to encourage, support and believe in you. I promise to say, "Yes, you can do it! ", to recognize your strengths, to see your potential, especially when you can't see it yourself. Why should we be with someone who only cuts us down, criticizes us, and makes us smaller? 2. 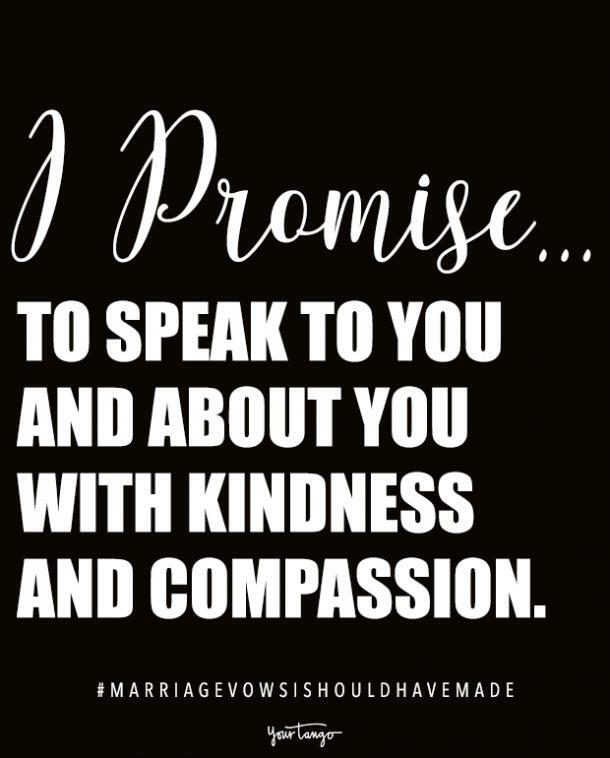 I promise to speak to you and about you with kindness and compassion. Because the true essence of love — at its very core — is kindness. If it isn't kind, it isn't love. 3. 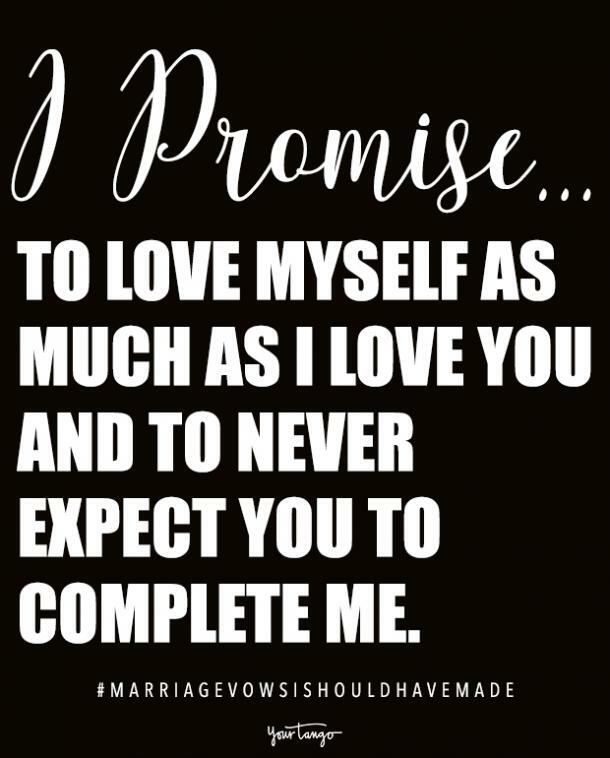 I promise to love myself as much as I love you and to never expect you to complete me. And I hope you can promise me the same because we can never truly love each other if we can't love ourselves. 4. 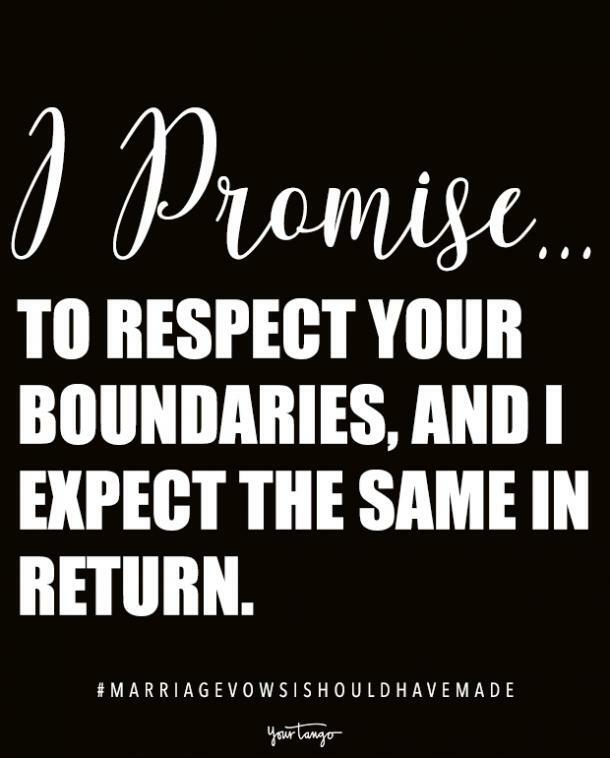 I promise to respect your boundaries, and I expect the same in return. We'll both be healthier and happier because of it. 5. 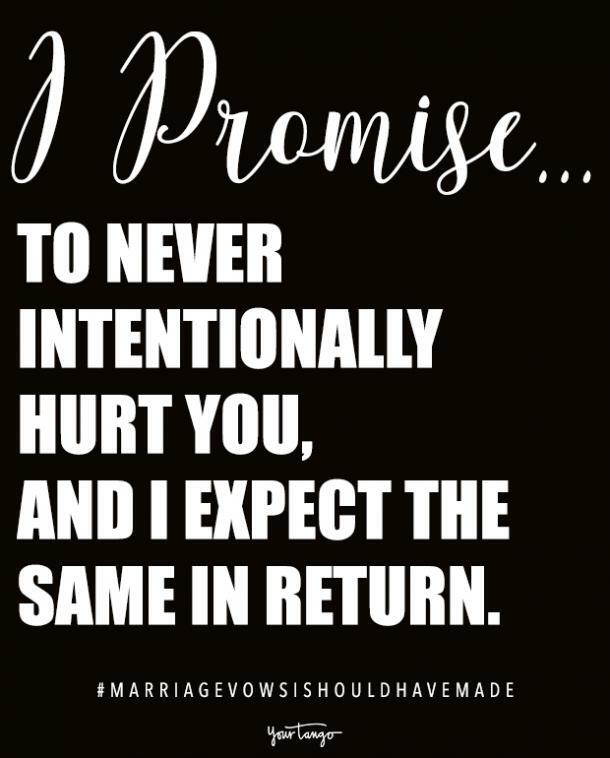 I promise to never intentionally hurt you, and I expect the same in return. 6. 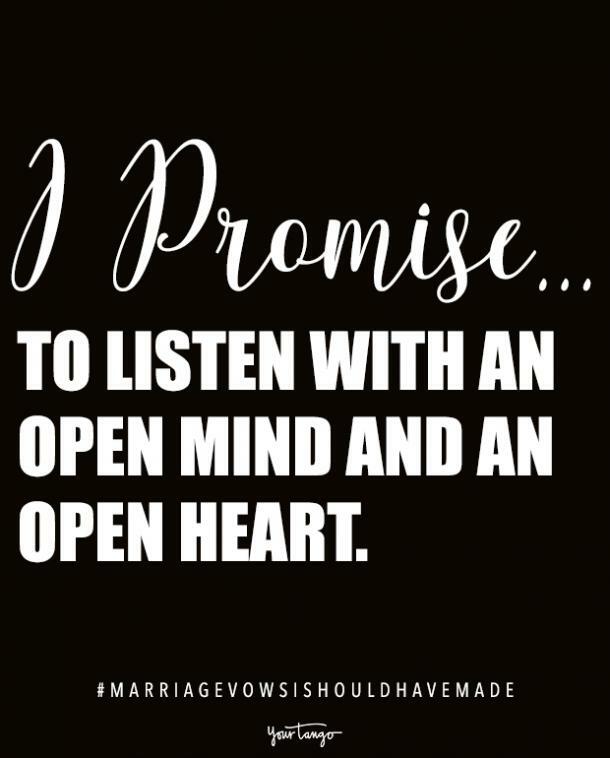 I promise to listen with an open mind and an open heart. 7. 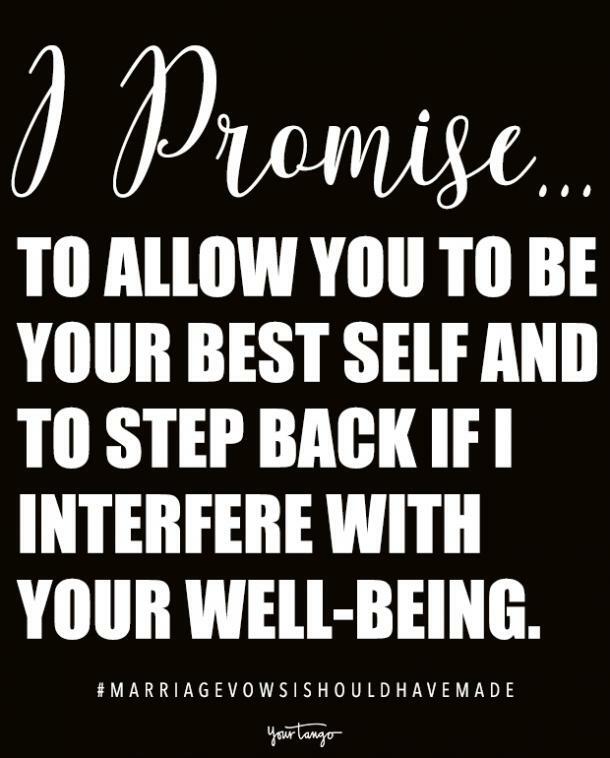 I promise to allow you to be your best self and to step back if I interfere with your well-being. 8. 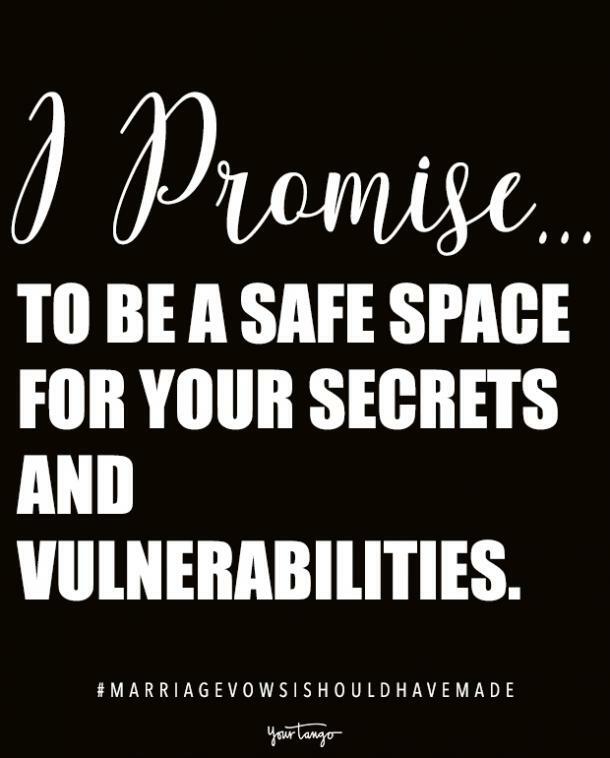 I promise to be a safe space for your secrets and vulnerabilities. 9. 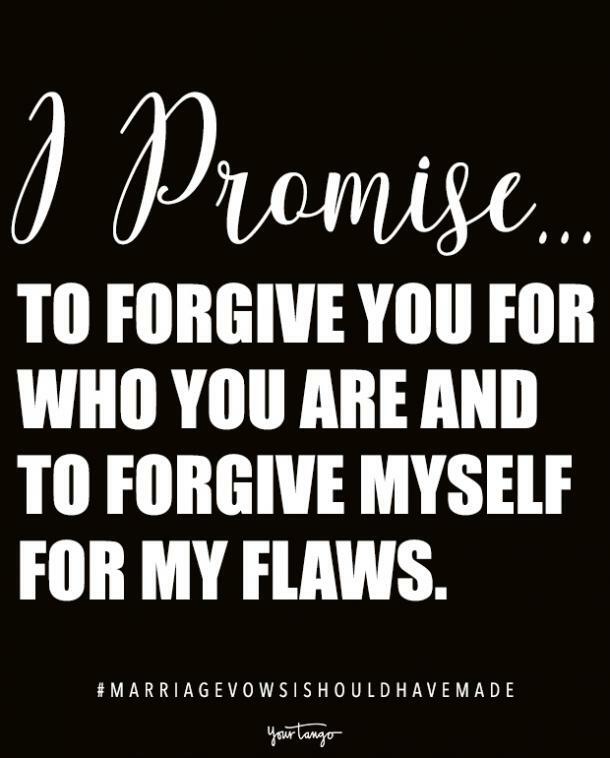 I promise to forgive you for who you are and to forgive myself for my flaws. 10. 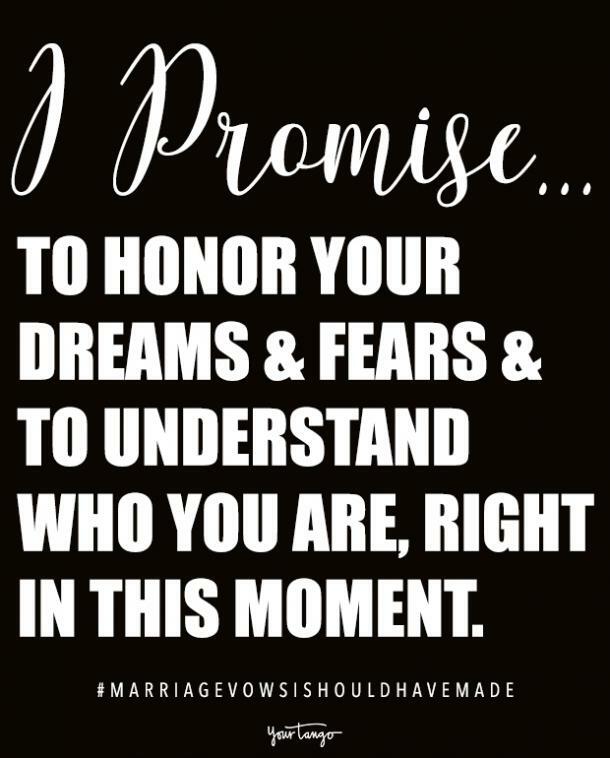 I promise to honor your dreams and fears and to understand who you are, right in this moment. Not who I want you to be or how I expect you to change. 11. 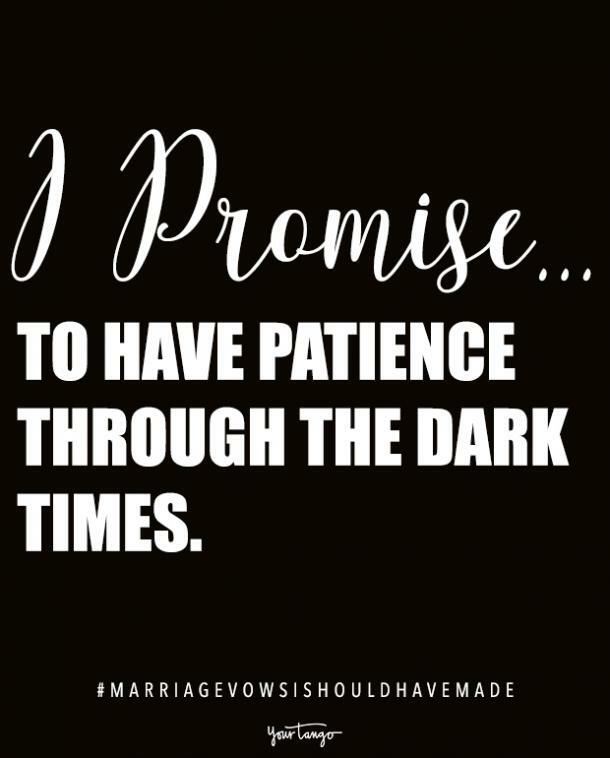 I promise to have patience through the dark times. The darkness always comes, and it's always temporary. 12. 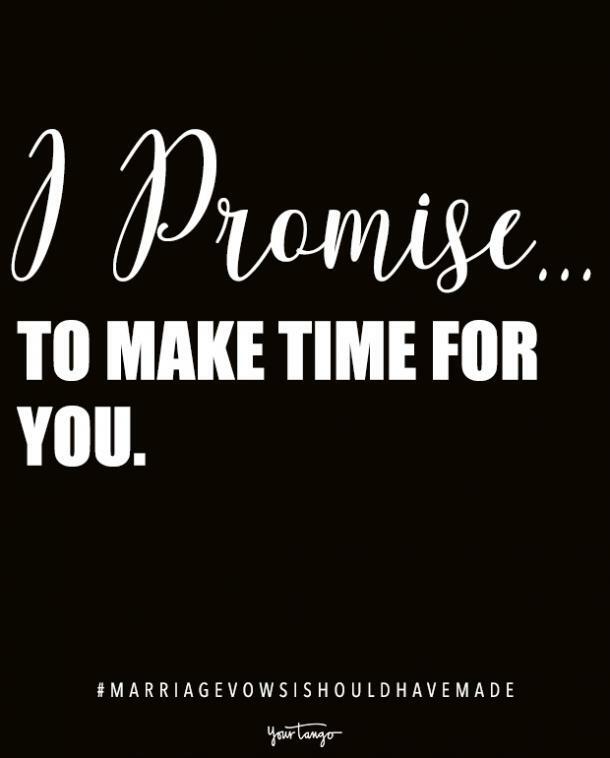 I promise to make time for you. 13. 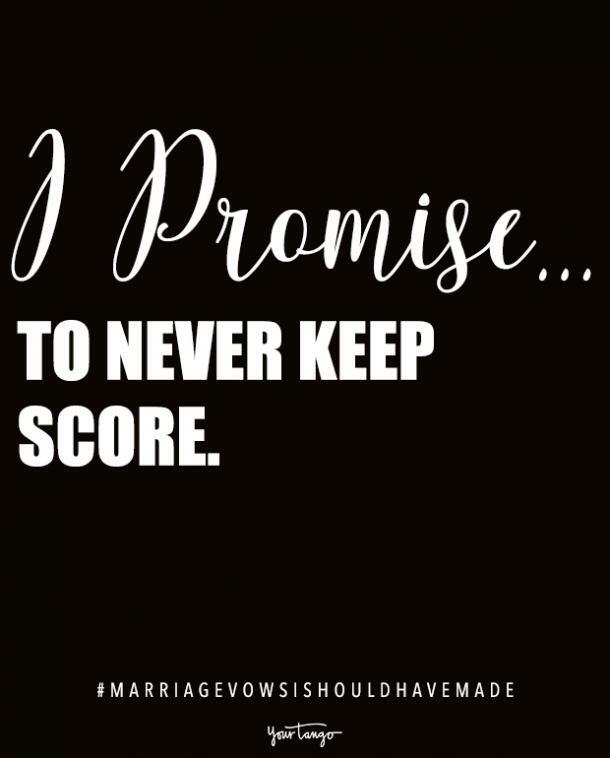 I promise to never keep score. The scales won't always be perfectly balanced, and that's okay. Even when it doesn't feel like an option. 15. And if one day we realize that the most loving choice in our marriage is to part ways, to grow in different directions, with different experiences, I promise to be okay with that. While I'll never threaten divorce out of anger or fear, I promise to be honest about the health of our marriage and to ALWAYS hold love and kindness for you in my heart.